Rev Robert Maxwell was the minister of the church covering the parishes of Prestwick and Monkton in Ayrshire. He was ordained there in 1640 but was ejected from his charge in 1665 for non-conformity. Undeterred, he continued to preach in varous locations, including conventicles, in the Ayrshire area, as well as in and around Glasgow. Rev Maxwell died at Bogton House, Cathcart, Glasgow, on 26 March 1686 aged 75. 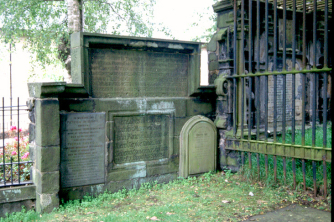 The memorial to Rev Robert Maxwell is located against the south wall of the Cathedral churchyard. 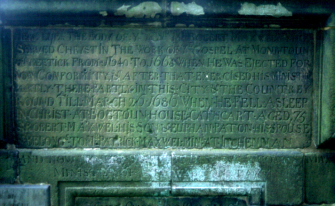 HERE LYES THE BODY OF : YE REVD MR ROBERT MAXWELL WHO SERVED CHRYST IN THE WORK OF YE GOSPEL AT MONKTOUN & PRESTICK FROM·1640·TO·1665 WHEN HE WAS EJECTED FOR NON CONFORMITY, & AFTER · THAT · EXERCISED · HIS · MINISTRY PARTLY · THERE · PARTLY · IN · THIS · CITY & THE COUNTREY ROUND TILL · MARCH 26 · 1686 WHEN · HE · FELL · ASLEEP IN · CHRIST · AT · BOGTOUN · HOUSEINCATHCART · AGED, 75.